Cleveland Museum of Art’s Startling Exhibitions Opens Windows to the Worlds of two exceptional women. Make your New Year’s Resolution NOW! Get off your computer, put down the cell phone and tablet, and even if you have to get in a plane, train, or automobile, come to the Cleveland Museum of Art ’s newest exhibitions. Right on the heels of their highly successful Kusama Infinity Mirrors exhibit , CMA brings together two exhibits that open windows into life and art in the distant as well as near past. Catherine de Medici and Georgia O’Keefe have each left us exceptional glimpses of what life was like in the 16th and early/mid 20th centuries respectively. 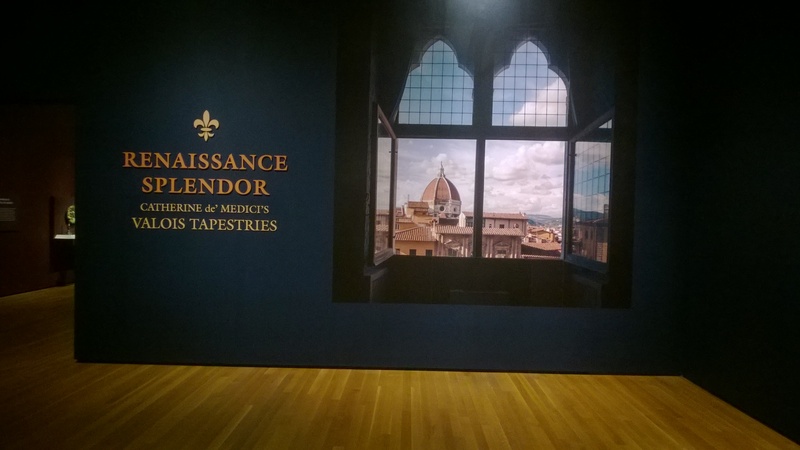 What is fascinating to see is how these two exhibits – Renaissance Splendor: Catherine De Medici’s Valois Tapestries, and Georgia O’Keefe’s Living Modern – reflect and contrast the life and times of each woman. This exhibition runs through January 21, 2019 in CMA’s Special Exhibition Hall 003. Six (of eight total) tapestries made this trip and the only place you can see them now, outside the Uffizi if Florence, Italy, is at the Cleveland Museum of Art. After that, they return to Italy and if you want to see them again, you’ll have to go to Tuscany. Catherine de Medici, wife of Henri II of France, was widowed fairly young and became regent for her sons Francis and Henri III, as well as her daughter Margot and son Louis. She ruled France with an iron fist and was responsible for some fairly heinous actions, especially the coordinated slaughter of Huguenots (French Protestants) at the St. Bartholomew’s Day Massacre. She also ordered and had made the magnificent Valois Tapestries commemorating her rule as well as celebrating the royal Valois dynasty despite this ongoing period of political strife and social upheaval. She gifted the eight room-sized tapestries to Christina of Lorraine when she married Ferdinand I de’ Medici, Grand Duke of Tuscany, one of Queen Catherine’s many Medici relatives. This is how French tapestries extolling the Valois dynasty and Catherine’s family, in particular, ended up in Italy. The tapestries were a huge expense and a visible expression of the power and might of both the French dynasty and their Medici connections. They depict a wide range of pageants, jousts, slaughter, slavery and all aspects of the royal life in the Valois Court. Catherine, her sons, and daughter are depicted throughout. The layer upon layer of activity makes these sometimes difficult to see all at once, but with careful examination, you come away with a complete feeling as to 16th century aristocratic and royal life entailed. It’s a pure paean to power and might, although it should be pointed out that Catherine’s children were sickly and all her sons – both Kings Francois and Henri II and Louis, Duc D’Alencon – died young. Her hated son-in-law became Henri IV (and one of France’s better Kings) after giving up his Protestant beliefs, declaring that “Paris is worth a mass”. 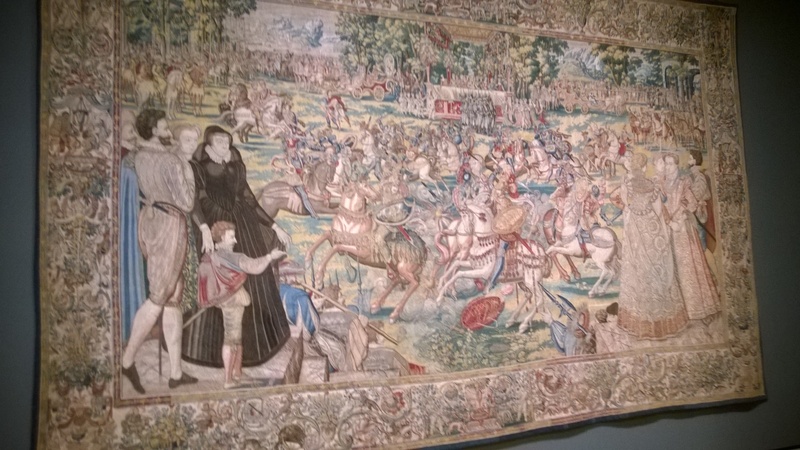 However, when these tapestries were commissioned, the Valois were at the height of their power, related to Popes, Dukes and royalty throughout Europe. These tapestries capture them before it all went away. And in the middle of these images is Catherine, always dressed in black mourning for her husband Henri II. He died when their children were young in a jousting accident and although he was spectacularly unfaithful to her, openly flaunting his mistress Diane de Poitiers, she wore black for the rest of her life. You think today’s royals with suspected hurt feelings between Duchesses Catherine and Meghan are dramatic? They have nothing on the continuing soap opera that were the dynasties of France. Another reason these tapestries are so special is the restoration process that was done to bring back their vibrant colors and repair any damages incurred over 400 years of wear and tear. Woven with wool, silk, and precious metal-wrapped threads, the tapestries were in need of some tender care and that’s what expert restoration gave them in Florence. By creating special solutions for cleaning, as well as matching pigments, stitches and even the metal wrapping of threads, the Uffizi’s restoration brought about a startling revitalization of these magnificent works of art. The Uffizi Galleries and the Cleveland Museum of Art gratefully thank the Friends of the Uffizi and especially Mrs. Veronica Atkins, for supporting the restoration of the Valois Tapestries. If there is any way you can get to the Cleveland Museum of Art before January 21, 2019, we highly recommend that you see these unique pieces of history. 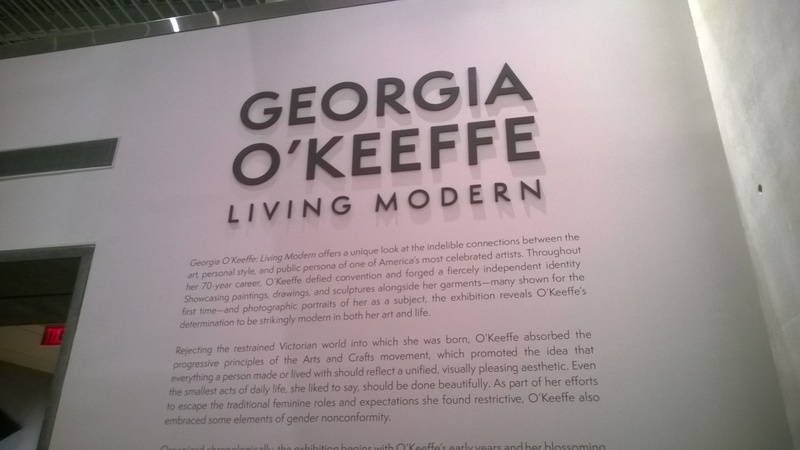 Also as part of your experience at CMA, we heavily recommend you visit the Georgia O’Keeffe: Living Modern exhibit in Special Exhibition Hall 004. You have until March 3, 2019 to see this brilliant exhibit of one of America’s premiere artists. 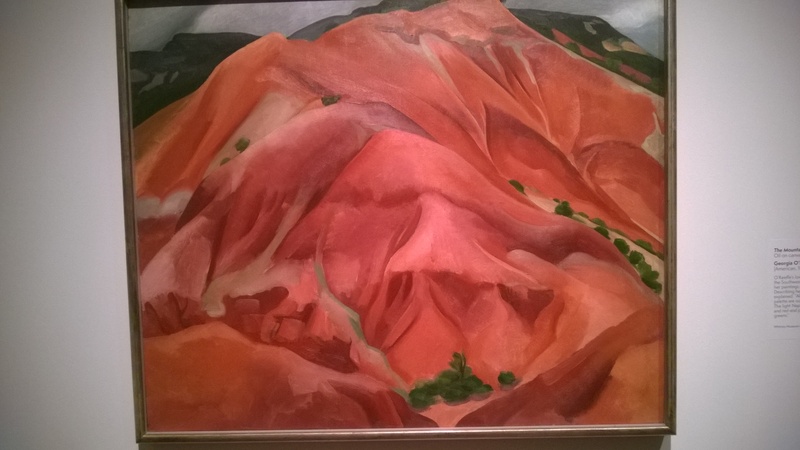 Georgia O’Keeffe was one of the most prolific American artists of the twentieth century, and is today commonly recognized as the mother of modernism for her bold and innovative art that included distinct flowers, dramatic cityscapes and landscapes, and later in life the images of animal skulls in the majestic desert. Her approach to art as a whole was inspired by fellow artist Arthur Wesley Dow, who taught her that art did not have to be copied or represented in some other fashion, but that it should be based on personal style and interpretation. Thus, began a dramatic journey for O’Keeffe, from her early watercolors while studying at the University of Virginia in the early-to-mid 1910s, her 1920s abstract art with floral designs, such as the Red Canna paintings (which many felt represented women genitalia), to her 1930s paintings of animal bones depicted in New Mexico landscapes, such as Cow’s Skull: Red, White, and Blue and Ram’s Head White Hollyhock and Little Hills. Through her life as an artist, O’Keeffe nurtured her bold expressions of interpretation, and created art for herself and not necessarily for the general public. But still to this day, her works stand the test of time among other famous modernist artists such as Pablo Picasso and Henri Matisse. And now until March 3, 2019, the Cleveland Museum of Art is very proud and honored to have the distinguished collection of Georgia O’Keeffe’s most prized works. From her clothing designs to her paintings, the CMA’s exhibit reaches into the private world of this truly gifted artist.